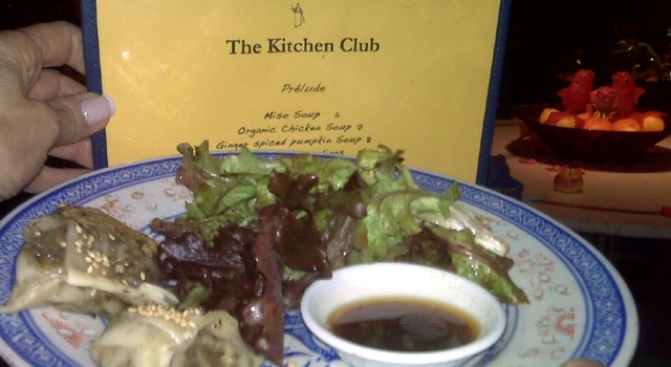 Under the heading "Stimulus Package," the Kitchen Club at 30 Prince Street on the corner of Mott is now offering a prix fix dinner for $25. You get three delicious dumplings and salad and a main course of rib-eye steak, salmon, or tofu, with biscotti for dessert and a glass of wine. Not one for tofu, I tried the rib-eye, which owner Marja Samsom said comes from grass-fed beef and it was tender and tasty. There is also a stimulus-package brunch for $15. The Kitchen Club is open for lunch Wendesday through Sunday and if you're lucky, you'll see Marja's bulldog, Chibi, making the rounds of the tables hoping something falls off your plate.